After the incredible reception in Timmins we made our way East again for a few days before we turn South East for a few weeks. The day after walking through Timmins we walked through some forest fire smoke, which looking back we probably should have drove through as it was rather thick. We were wondering what we were going to do as the fires were getting pretty bad around where we are and close to the communities that we will be walking through and the road we will be on. For the most part we didn’t have any issues and even though we were looking at alternate routes through QC to bypass the fires in ON it turns out that they had just as many fires in Quebec that Ontario had. We decided to keep walking and worry about the smoke or highway closure if it happened rather than altering everything with the chance that it could or could not happen and not worry about things that have not yet even happened. Turns out it was a good plan as we walked on and had no issues with smoke or fires closing the highways up to now. Just outside of North Bay we stopped for a few minutes to let a torrential rainstorm pass by. We booked a campsite just ahead and walked up to it but only to find out that it was not going to work. Sitting on the side of the road we called around to others in the area but none of them had room or at that point any power due to the lightning storm knocking down a power line in the area. Not wanting to stay on the side of the road again, our only option was to travel ahead to a KOA campground outside of North Bay which we did and we were able to stay for two nights. We tried to get a group together to walk with us through North Bay but were unsuccessful with getting a large group. The local newspaper and TV station met up with us and got some footage and I was gifted another pair of shoes from a local orthotics shop, another pair of New Balance, which I have been liking so far, this may do me for the remainder of the trip now. The only person that came out to walk was Aline Major and she walked with me and the kids through town and back out again. It sure makes the time go by when I have someone to talk to while walking, the kms seem to roll past without much effort or thought. Leaving North Bay seen us heading East again back on Highway 17 and back to more populated areas. Now we hit a little town every so often and are never too far from the next town, which is nice to see and know. One afternoon we decided to take a rest at a roadside picnic area for an hour and rest our feet a little before Mattawa. After the hour the smoke started to come in. Since we had a good amount put in for the day already we decided to call it a day as the smoke was getting thick fast. As we drove forward towards our campsite for the night there were fires along both sides of the highway. It was interesting to see and yet at the same time it was a little unnerving. We got up to a little gas station for a couple things and there was an OPP officer that was heading back to shut down the highway we just came up. Good thing we decided to finish up the day when we did! The next day I wanted to start where we finished off so we headed back to asses the situation. The smoke was thick the whole way back to the picnic area. Regretfully we had to drive ahead 69 km to get ahead of the smoke. That took us to the Chalk River area where we started walking for the day a little before noon, which brought us into Petawawa for the night. We took some time to go and check out the Military museum that afternoon which was really neat to see and the kids liked to see all the memorabilia. Having made dinner plans with someone who reached out to us and offered to host us for dinner we hit the campground and quickly set up before heading over for a visit and dinner. It was great to meet new people along the way and thanks for dinner and the visit and joining us for a walk the next day Jacquie and Nick! Next stop was Perth and a rest day on Otty Lake. Nice to see the scenery changing again and it feels like home here with all the farms and flatter countryside. We have been hitting some rain recently for the last couple of days, the mornings are dry and warm then the afternoons open up and we finish off in the rain. The area REALLY needs the rain. We ended the day in Carleton Place and headed into Perth to dry out and take a rest day. Kristie and I rolled for two hours on our rest day and put in 12 kms to get us closer to Perth so that we could make it there the next morning and walk through town with all the crowd we had lined up. 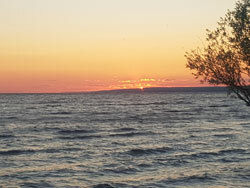 Spending the day with good Friends in the Perth on Otty lake was a great time and nice relaxation. After some media engagements and radio interviews and a boat ride and swim, we finished off our last rest day of the trip. We got the news that Mom’s good friend had taken a turn for the worse and her cancer battle was coming to an end soon. Mom really wanted to go and see her prior to her passing away but was torn as she committed to me to be with us for every step of the journey. After talking to her and letting her know that it was okay and I would rather that she go than to regret not going. 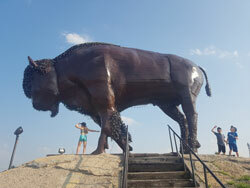 So, she made a decision and we got her on the plane in the afternoon heading for Grande Prairie. The next week will be interesting with one crew member short, but I am sure that we will manage just fine. 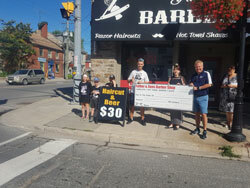 Walking through Perth having friends and media join us – thanks Michael, Emery, Krista and Lori. 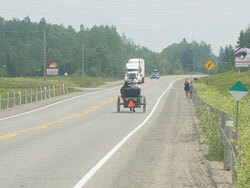 We headed East again towards Smith Falls where I was joined by another Friend – thanks Linda and then on towards Merrickville for the night, where we saw a boat lock and the first lift up bridge on our trip. It is neat seeing a community that recently celebrated 150 years and some of the architecture and buildings that were just as old. 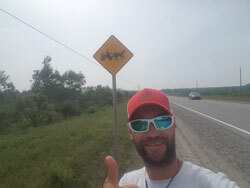 Continuing East for half the day then turning the corner North towards Ottawa and the last leg of our trip through the massive province of Ontario. We entered on June 12th and will be crossing the bridge in Ottawa on July 28th into Quebec after 47 days and on Terry Fox’s birthday. 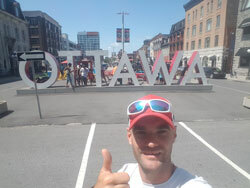 July 28th was a great day heading towards Ottawa. After a live interview on CTV last night at the campground we decided to load the kids early into the Nissan and leave the motorhome parked for the day rather than try to drive it through Ottawa. Knowing that today was Terry’s birthday and we would be at his monument in Ottawa today made it extra special. We had also planned on meeting up with our friend the cyclist Susan today. Getting an early start with the kids wasn’t quite as bad as we thought as they went to bed early last night, that and a couple of movies later and we rolled into the downtown core of Ottawa. Heading towards the Terry Fox monument and the parliament buildings was really neat. 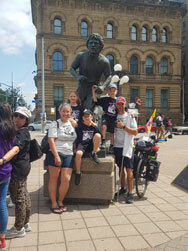 The unfortunate part was everyone was there to look at the parliament buildings but there was nothing happening at the Terry Fox memorial for his birthday! It seemed as though no one there even knew it was his birthday, which was a little disappointing. To support the Can-Survive Walk, visit our Donations page. Donations both big and small will go towards the L Foundation’s endowment fund. Thanks in advance for your support! To date, over $28,700 has been raised to eradicate this dreadful illness. According to the Canadian Cancer Society, over 80,000 people in Canada died from the disease in 2017.